Chrissie is hanging in there as she rests in her drug-induced coma on life support machines. Be praying that God would heal Chrissie fully from head to toe, and when she begins to wake from the coma and they start to wean her from the machines that her heart would beat beautifully, perfectly and miraculously, in sync, pumping properly at all times, and that her lungs and blood gasses (oxygen and carbon dioxide) would all remain where they should be. Pray, too, that Chrissie will be able to remain infection-free. Her chest is still open. Our blog had over 13,000 hits yesterday. That tells me that atleast 13,000 prayers were lifted up for our precious princess, and I know that even more people are praying who didn't physically click on our blog. There's a mighty army of prayer warriors out there, many of whom we've never met. We are oh so grateful for all of the prayers. That's what's keeping us going, giving us grace and peace, and keeping Chrissie alive and fighting! To God be ALL the glory. Keep praying as we can feel when the prayers lighten and when we have amazing coverage. God is so good! 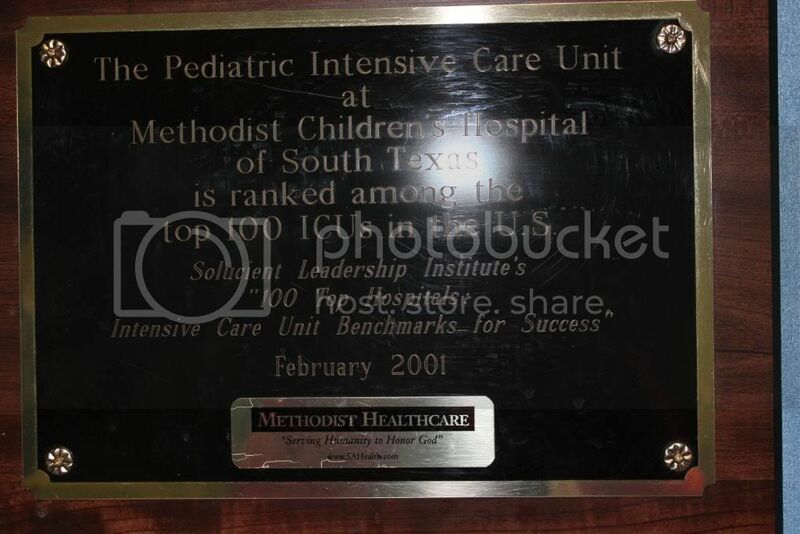 Our hospital's ICU is ranked among the top 100 ICU's in the US! 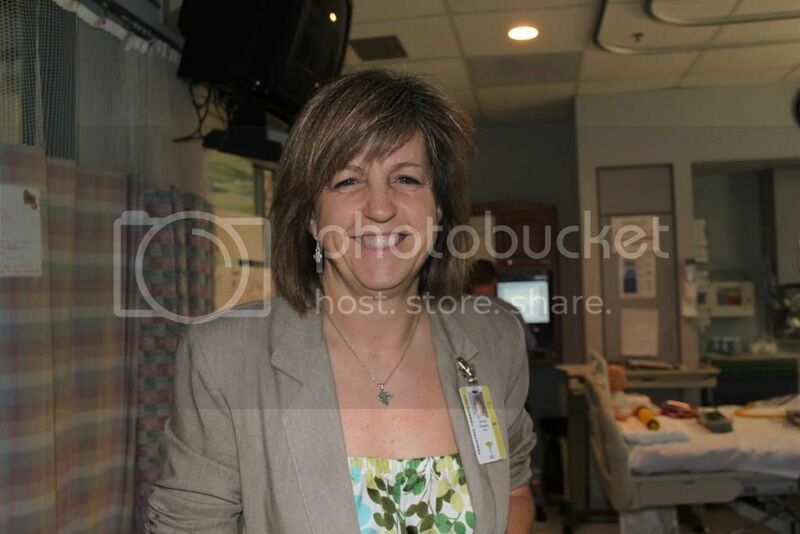 Dr. Mary Porisch, our God-sent cardiologist, who has been wrestling with God on behalf of our daughter. We are beyond blessed that God chose her for Chrissie's care, along with the cardiac surgeon, Dr. Kupferschmid. (I don't have a photo of Dr. Kupferschmid, but Dr. Porisch was nice enough to pose for me, even though she loathes having her photo taken. Dr. Porisch is so humble; she never takes credit for anything as she always gives God all the glory. We've been so blessed by her prayers, support, strength, tears, battling spirit, wisdom, expertise, compassion, empathy, tears, love and friendship. We love you Dr. Porisch, and we'll never be able to express how grateful we are for you. 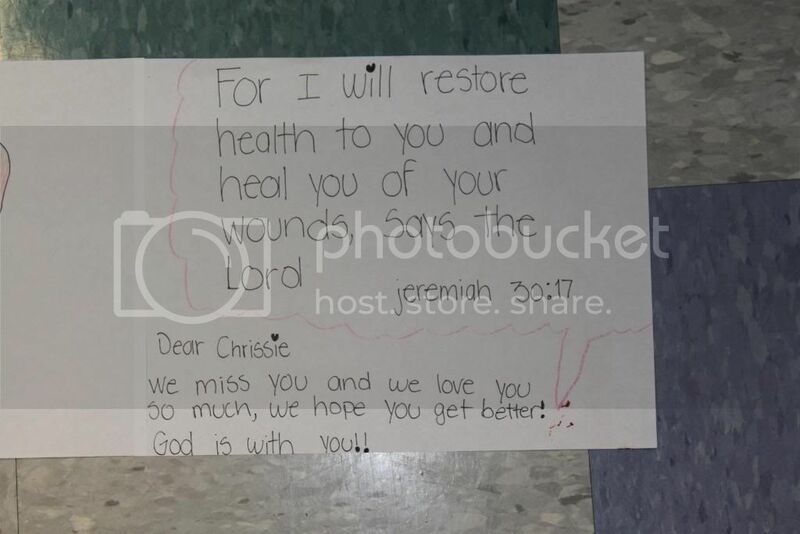 Our kids made pictures and wrote Scriptures and prayers for Chrissie, which are displayed all around Chrissie's PICU room. It brings a hope and joy to the room...thanks kids!!! Chrissie's favorite shoes, which are just what the doctor ordered...high tops to keep her foot in a "normal" position. Everyone who comes into Chrissie's room comments on her red shoe! Chrissie has been given platelets to help with proper blood clotting. 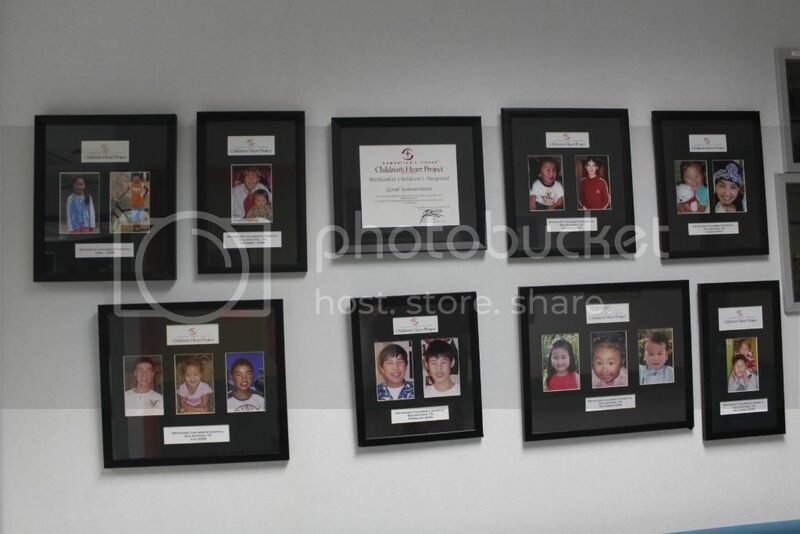 Kids from other countries whose lives have been saved by the heart project that Dr. Porisch and Dr. Kupferschmid graciously serve on the team as heart missionaries, repairing hearts around the world. Our beautiful princess, Christyn Joy. Our little sleeping Serbian Sensation! One of the supply bins in Chrissie's room. 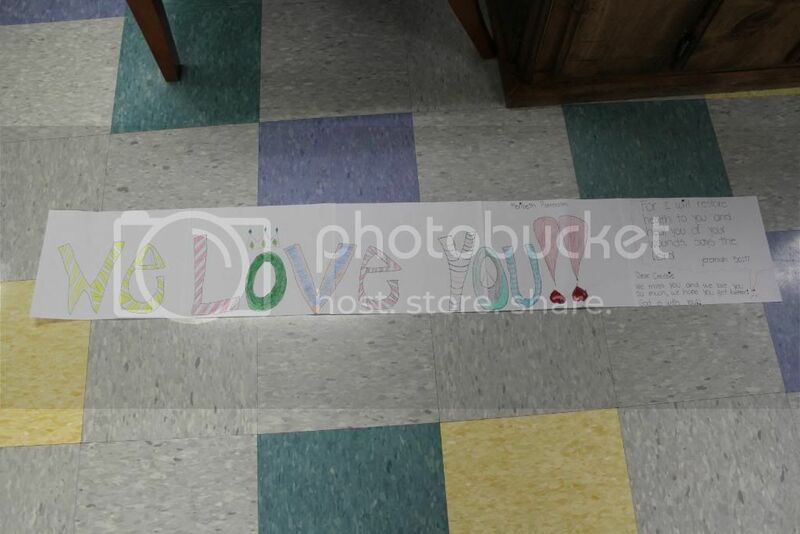 This was brought in with the ECMO machine, after Chrissie was gone for an hour yesterday. 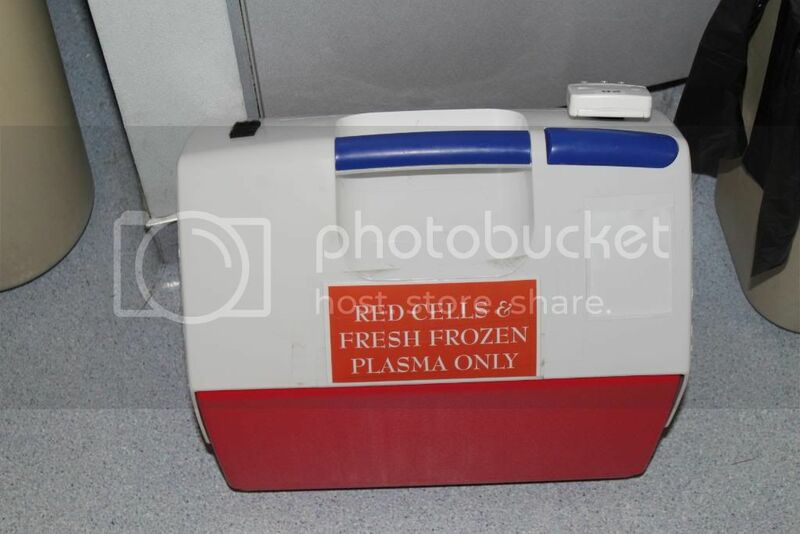 There are now lots of extra machines,bins, a refrigerator of blood products, and lots of people in the room at all times. This is Chrissie getting an ECHO of her heart this morning. They do this multiple times/day. 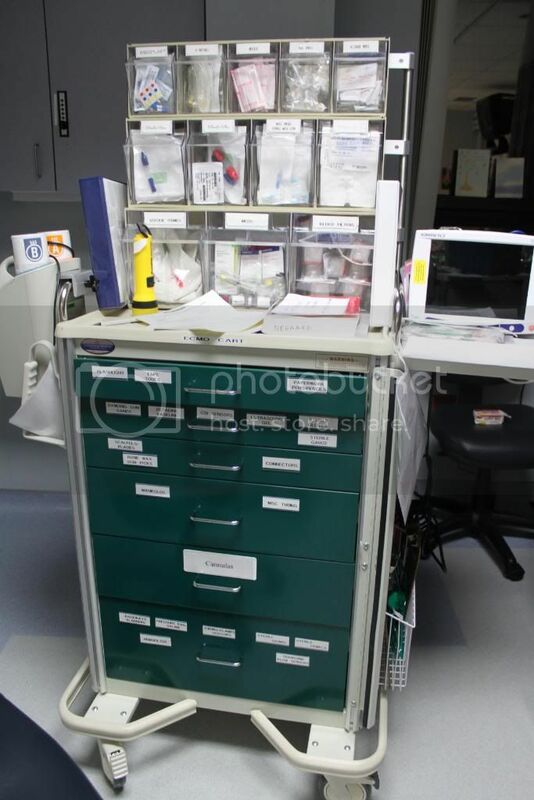 The room is very large, and now we know why: to get all of the life-saving equipment in here! Matt is the one standing in the right corner of this photo, looking on. We hang out in recliners at the very end of the room so that there's space for all of the medical staff to come in and out. I'm lovin those scriptures...surrounding Chrissie with the WORD is powerful!! I can't help but wonder at God as He is working through your sleeping princess to touch the hearts of THOUSANDS...maybe even a hundred thousand...bringing them back to HIM. Oh Chrissie...I so want you to wake up soon..but while you are sleeping your Heavenly Papa is at work for good! I pray He is ministering to YOU as you sleep. I just know He is. We are praying and asking everyone we know to do the same. We are all praying desperately for Chrissie. Our son was in stage 1 heart block after heart surgery,and we gave him the supplement CoQ-10,and it brought him out of heartblock and improved the functioning of his heart muscle. Praying for your sweet daughter in Indiana! Continuing to pray for Chrissie and your entire family. Praying for your sweet Chrissie and for you and your husband. 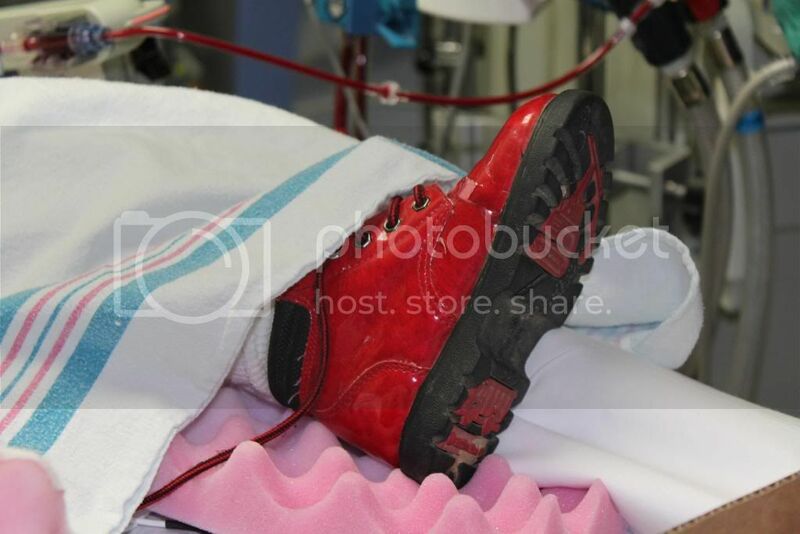 Just had to write and tell you that as my daughters and I were checking your sight for updates this morning, my youngest (Lili, 4)was looking at the picture of Chrissie in the hospital bed with red shoe. She said, "Is that Chrissie?" I said that it was and she said, "Oh Little Chrissie, get well soon! 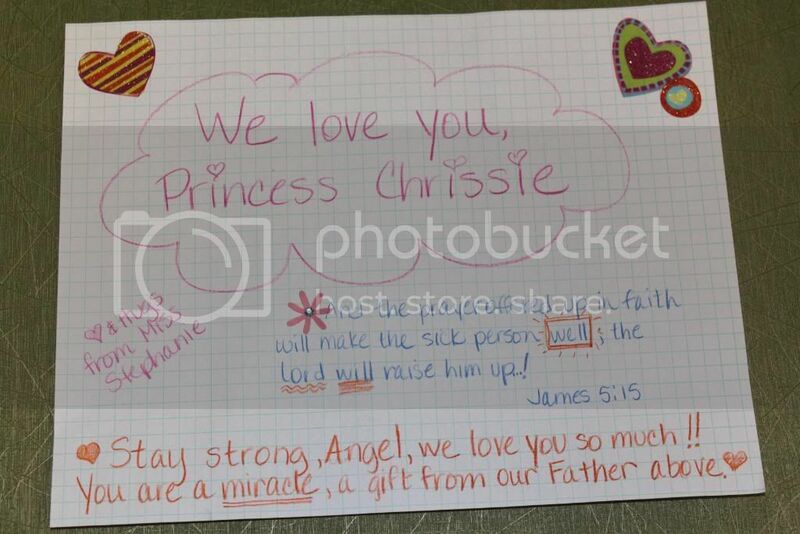 Jesus please help Chrissie get well!" That is our familiy's continued prayer for you all!! Continued prayers for a complete healing for this precious little soul!!! Still praying. The fact that Chrissie is still hanging in there is miraculous in and of itself. As a momma to a heart baby herself, I cannot even begin to imagine what your family is going through. I'm praying that all turns out for your family and God heals your daughter's heart. Know you and your entire family are in my thoughts and prayers! Praying so very much for all of you and the doctors , nurses and knowing that she is in the best hands with God on her side always. God is so good and he is there always through our storms of life. Lots of prayers for Chrissie, and for your strength as you continue to experience God's plan for Chrissie's life. Praying for Chrissie's heart to be ready to do it's job after a short, well needed rest. Perhaps it would help now or soon after she is stabilized. Praying, praying, praying here in Iowa. Please add us to the many thousands who are praying for you and precious little Chrissie. God is Great. You do not know me but I know the pain you are going through right now. Our little girl was adopted from China and her heart failed four months after coming home. 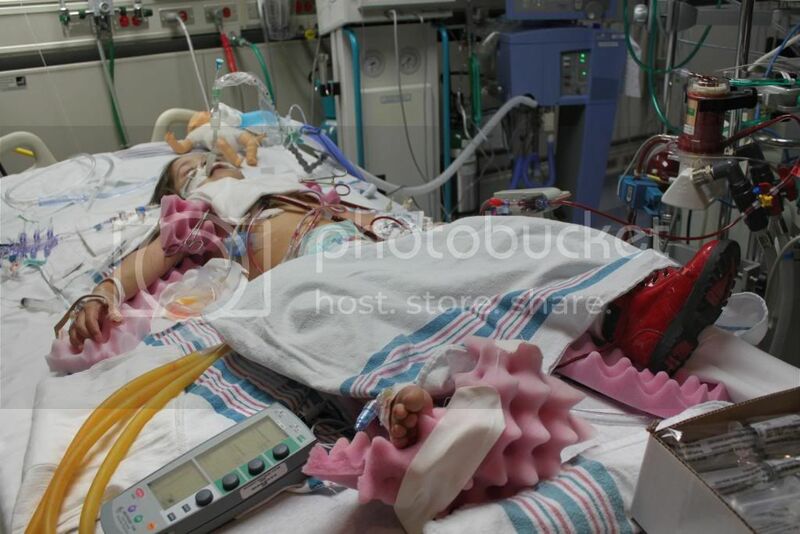 She was on life support (the Berlin heart and vent) for months. I am writing to tell you to keep the faith, keep praying and keep asking folks to storm the gates of Heaven on Chrissie's behalf. Brea is alive and well today and just celebrated her third anniversary with her new heart. 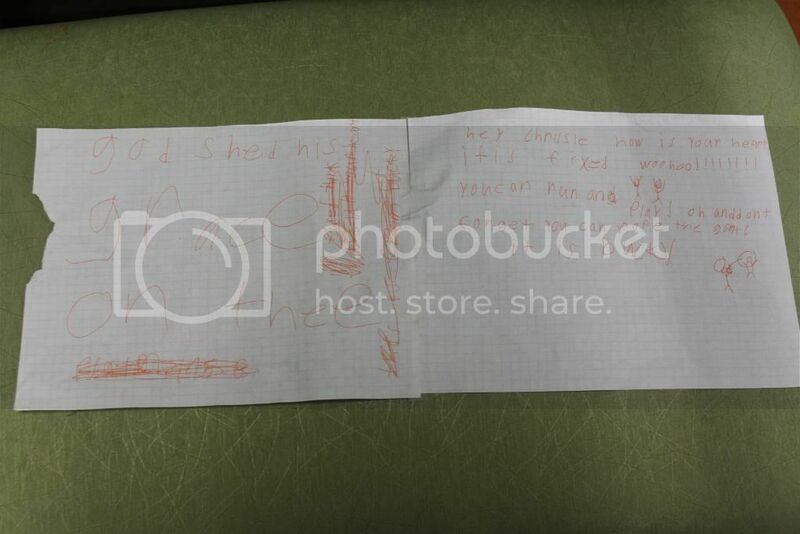 When I saw the photos of the notes, pictures and scriptures you've hung in the hospital room it brought back so many menories. I did the same thing. I wanted every person who walked in that hospital room to know that our daughter was a child of God and that there was a mighty team of prayer warriors fighting for her to live. We prayed for all those caring for our daughter and we told them that we were praying for them. We were amazed at those that were so open with us about their own faith (especially since our daughter was not in a Christian based hospital) and who prayed with us for our sweet girl. 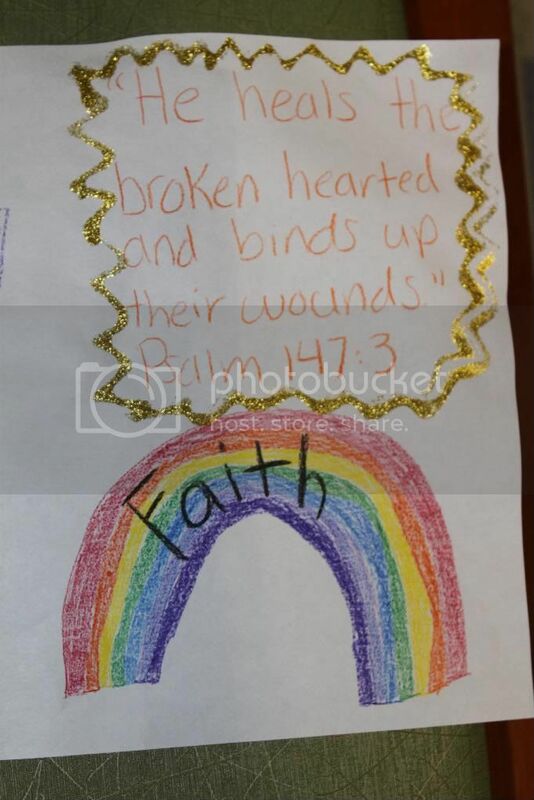 Faith is going to bring you through this and lives will be touched and changed because you have so willingly opened your heart to the world and shared your pain, faith and love for this child with everyone. God bless you. You know exactly what is going on with Chrisse and you love her beyond what we can imagine. Thank you that you hold her, that you comfort her and that you are the One God who is Mighty to Save. Wrap your loving arms around her family now and saturate them with your peace that passes all understanding. *** Mama to an awesome heart baby from China. Praying for your sweet girl!Lifting her up before the Great Physician! The prayers of the righteous availeth much. I am praying and will continue to pray for healing. I am one of your 13,000 who is praying. I was led to your blog through a post at RR. I've been visiting the blog and praying since then. I just came across your blog yesterday and my heart is just broken for your family. But, I believe that God is Good ALL THE TIME!!! And, He is a healer. 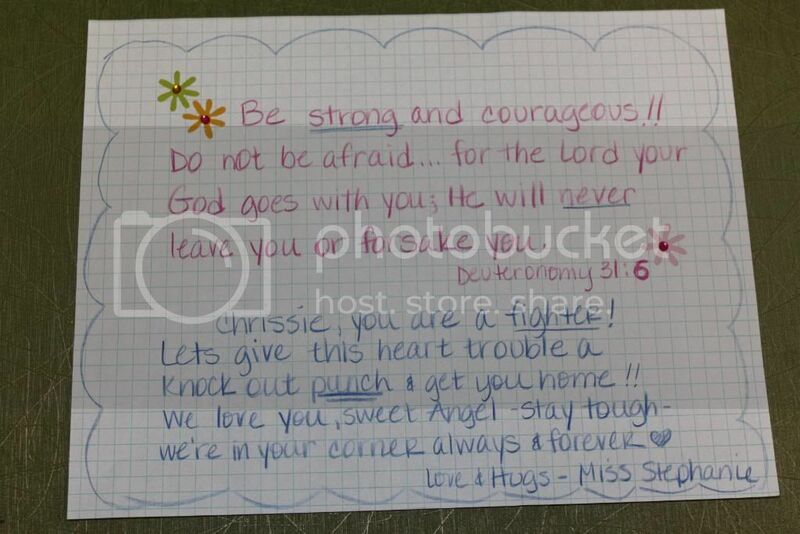 I have been praying hard for Miss Chrissy since I read her story. I feel so much love for your sweet Serbian princess! She is beautiful! Prayers and lots of love for you family. Your willingness to share in "real time" and with such honesty has blessed me tremendously. My prayers for you have long ago stopped being eloquent (as if they ever have been to begin with) All I seem to get out is "help and heal her God". Plus, I've felt overwhelmed the past two days, but "overwhelmed by what?" I ask myself. Today I realize that I'm overwhelmed by what I am seeing. Lorraine and Matt, I see God all over your family. I look at you, at this crisis - this crisis that no parent wants to face - and I see Jesus. I see how he has been so evident and present with you during the worst of moments. He has shown himself to you each and every day. I see Jesus in how Meribeth encouraged you with her sweet words. Here we were all worried for her and God knew all along that she was equipped to care for you right now. I see God in the care and attention of everyone at the hospital from nurse to cardiologist. I see God when you say that there is peace in Chrissie's room. I see God in the red shoe! I see God in your husband and your kids. God is not only working "in" you, but also "around" you and "through" you to others. More than anything, I see God in your ability and willingness to keep up a blog during this time. If that isn't God's power at work, I don't know what is. It should be me who comforts you right now, yet it is your family who is comforting me! How can that be? Only through God! To any non-believers out there who read the comment section; God is good, so very good and His love surpasses anything you can experience here on earth. I ask you, can't you see him too? I want you to know that the God who is loving and caring for the Pattersons is the same God who is waiting to love and care for you. Receive his love and trust him with your life! I called one of the strongest prayer warriors that I know, and we prayed together today for Chrissie. She claimed Psalm 118:17over Chrissie. My prayer warrior told me to tell "Chrissie's sweet mama" :) to plug your faith in and claim this verse out loud over Chrissie. She is a very very dedicated prayer warrior...the one I call when I really need to pound on Heaven's gates...and she has committed to pray for Chrissie constantly. I thought I'd drop you a note to let you know. Praying foe sweet Chrissie and each if you. Asking God to do His wonderful, miraculous, awe-inspiring, mountain-moving, healing thing! Much love and prayers from PA!! Praying in Seattle for Chrissie and your family! Our little ones all requested to pray for Chrissie this morning....such tender simple prayers...I could not have prayed any better! Praying for God's will from Alabama. Praying that Chrissie will get more time here on earth with her wonderful adoptive family. I heard of Chrissie and your family just a few days ago, and have been praying for your miracle ever since. God bless Chrissie, and each and every one of you! Chrissie had been on my heart first thing in the morning and I cannot go to sleep at night without lifting her up in prayer as well. Praying for you all at this time. Praying and believing God to clear her lungs, sychronze her heartbeat and fully restore as your sleeping Serbian Sensation rests. God is still able, He is mighty to save. I was thankful to hear of the peace the LORD is giving you as we pray. So awesome to see the face of Dr. Porisch. She was the recipiant of some extra prayers of gratitude and of course prayers for God's wisdom to direct her. My home computer does not have the capacity to open the photos but I will figure out a way to print out her picture to put on my prayer bullitin board. Praying for your sweet girl. praying, praying, praying, Praying for Chrissie your precious miracle. We are sharing her updates with our facebook family and our adoptive, and CHD friends.She has so many prayer worriors praying for her world wide. Nicki and family QLD Australia. A small miracle on my laptop- I was able to open the pictures long enough to print out Dr. Porisch's picture and she is on my prayer board. Your family is engraved in my heart forever to pray for you but I will print out your picture too. I love the one where you are all dressed for Chrissie's ball. This is the first time visiting your blog. Chrissie will be lifted up in my prayers for a strong heart beat and recovery...I will also pray for you and your family. MY prayers continue! GOD IS ABLE! 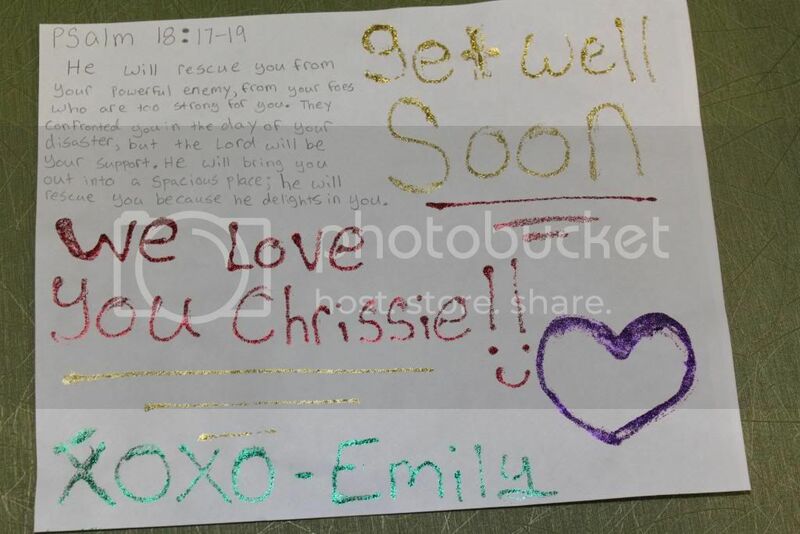 The pictures with the scriptures are so precious...... what wonderful scriptures for your precious Chrissie. Thinking of you all the time! Praying for Chrissie, please know how much we are hoping and praying she will make a full recovery and swim and dance and eat more chocolate cake! Continuing to pray and rejoice at your faithful example. Praying. Praying for you princess and your family. I just love her red shoe. The will to press on, in spite of the dark, knowing we walk with you. Give us a faith of desire and hope, the inward urge to achieve, All things are possible with you oh Lord, Let us Believe. A glorious faith to match the dawn of this day that you have made.